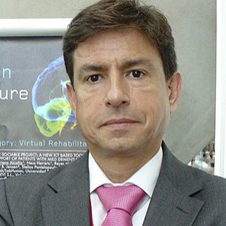 Professor Mariano Alcaniz Raya is full professor at the Polytechnic University of Valencia and Director of the Institute of Bioengineering and Human centered Technology (I3BH) of the UPV carrying out his research at the laboratory Laboratory of Human-Centered Technology - LabHuman. His research interest has always been focused on how virtual reality related technologies can augment human abilities and performance in fields like medicine, health, education and marketing. From a scientific point of view, his interest is to understand and classify the relevant significance of each aspect of the human activity and how to use this information in computer mediated technologies for enhancing human abilities and quality of life. From a technological point of view, his objectives are to improve interactive technology in virtual environments used at different formats and the development of algorithms, methods and techniques for ubiquitous and non-obtrusive measurement of human activity. He has been coordinator of various European projects and national research projects related to the area. He has authored and co-authored several book chapters and articles in scientific journals. He is also coordinator of several national programs of excellence in R&D. He is also the National Program Coordinator of the Information Society Technology of the Ministry of Science and Innovation of Spain.